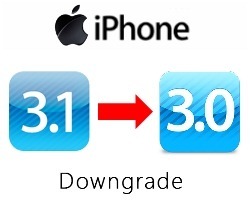 The following step by step guide will help you downgrade your iPhone with firmware 3.1 to firmware 3.0.1. For those of you who upgraded to iPhone 3.1 may have found your device to be locked and un-jailbreakable as the tools for jailbreaking and unlocking are not out yet for iPhone OS 3.1. Fortunately, there is still a way to downgrade your phone from firmware 3.1 to 3.0.1. I have tried it on my iPhone 3G and it works perfectly on it. It should also work on the original iPhone (aka iPhone 2G). This method wont work on iPhone 3GS. Also to note here is that while this method will help you downgrade your firmware from 3.1 to 3.0.1, your baseband will not be downgraded which means you cant unlock it for now. Step 1: Download and install iTunes 9 if you haven’t already. 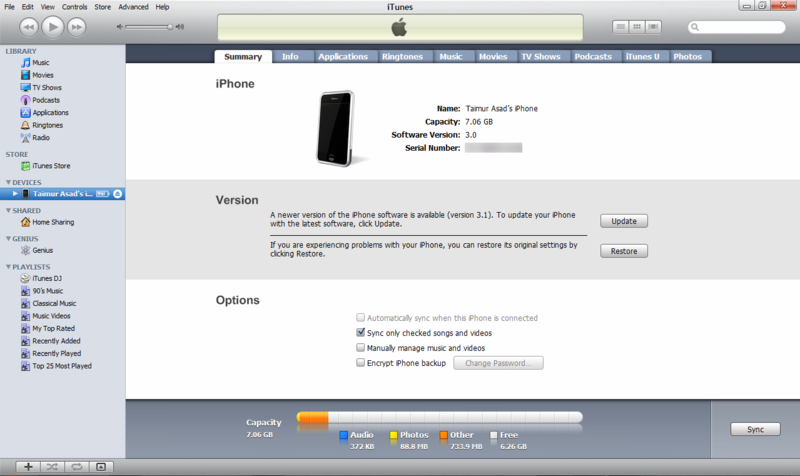 Step 2: Download iPhone OS 3.0.1 firmware for your iPhone (3GS, 3G and 2G). Download links are given below. Mac OS X: "~/Library/iTunes/iPhone Software Updates"
Windows 7: "\Users\[username]\AppData\Roaming\Apple Computer\iTunes\iPhone Software Updates"
Windows Vista: "\Users\[username]\AppData\Roaming\Apple Computer\iTunes\iPhone Software Updates"
Windows XP: "\Documents and Settings\[username]\Application Data\Apple Computer\iTunes\iPhone Software Updates"
Step 4: Connect your iPhone with your computer and start iTunes, press and hold shift key and then click on “Restore”. Just ignore this error and close iTunes. Your phone will now be in recovery mode, showing iTunes logo and usb connector. Once your iPhone has restarted, close QuickPwn. Step 6: Start iTunes again with the original AT&T SIM card. iTunes should now show the firmware version as either 3.0 or 3.0.1 depending on which ever firmware you chosed to downgrade to in Step 2. Step 7: You can now jailbreak your iPhone which you have downgraded from firmware 3.1 to 3.0.1 by following the step-by-step jailbreaking guide posted here. Feel free to ask me any question regarding any problem that you may encounter during the downgrading process. UPDATE 1: Downgrade of iPhone 3GS from firmware 3.1 to 3.0 is now possible. Follow the step-by-step guide posted here to downgrade iPhone 3GS with firmware 3.1 to firmware 3.0. UPDATE 2: Jailbreak and unlock is now possible for iPhone 2G and iPhone 3G running firmware 3.1. Follow the complete step-by-step guide posted here in order to jailbreak and unlock your iPhone with firmware 3.1. UPDATE 3: Downgrading of Baseband for iPhone 3G running firmware 3.1 is now possible. Complete step-by-step guide on how to downgrade your baseband from 05.11.07 to 04.26.08 can be found here. Yesssss!! !, Thank You so much it works with my iphone 3g. this is really works to me…. once again Thx you very much…..
hello. i've tried that on mine. after it says restoring and stuff my iphone got reboot. that means its downgraded? or something should show up after or no? lol. I NEED HELP PLEASE! ok i got my i phone 3G and had it jail broken and unlocked to use with t-mobile in november 09….i then made a really stupid mistake yesterday by trying to upgrade to the newer version. plugged it into i -tunes and downloaded new version. said there was an error and now my phone is on the lock screen where it only lets you do emergency calls….point being. i just want my phone back even if i lost all my apps and numbers i dont care. SO please if anyone with more knowledge could give me a pointer i would be so greatful. Shift+Restore will not work for me! Help? Pls advise how to jailbrake&unlock my iphone 3GS&3G. I confuse about step 3 and I could not get to the error code 1015.
hi i have windows vista and i downloaded quickpwn 2.2 and it says that quickpwn stopped working,please help! yep dats easy! just plug n2 ur computer and make sure itunes is running. U then want 2 press and hold down the Lock button and the home button. iTunes will detect a recovery mode 4 ur iPhone and only give u the option 2 restore. U will lose erything and ur phone will be locked again so ull have 2 get it unlocked. And it will put the Latest firmware on the phone which im not certain that they have an unlock 4 right now 4! I've managed to get recover 3.1.2 version until last point where error 1015 appears. I tryid to redo it number of times, followed up some other advices but I still can't make it to work. Please HELP!!! I had phone from ATT now is unlocked t0 O2 and after stupid update to 3.1.3 I can't make it work like Ryan. Once again.. anybody please help. where is the quickpwn download ? plz help me the quickpwn is not working i have vista .. what i should do now ?? hello, i have iphone 3gs 3.1.2 unlocked and jailbreak with blackra1n. but accidently i run spirit on that , now if i run blackra1n again, it keep getting reboot. so now what i have to do ? my shsh saved on cydia server, does it help at all? can i restore 3.1.2 firmware again and how? quickpwn keeps crashing on windows vista and i cant get it to load at all. any solutions? I've had the Quickpwn stop working thing…in fact, it won't even start, it just crashes and then closes. I'm on Windows 7 and run it in every form of compatibility mode. What am I doing wrong? Hey, we had the same problem. Thats because in the newest itunes versions the file pathe are not the same. It's tricky but you have to try using the quickpwn error log and get the old itunes Files. Maybe you found a old itunes download. That would be much easier. For those of you who have the “Quickpwn stopped working” error, right click on Quickpwn, select properties, click on the compatibility tab, select the box, keep it at windows xp. Hit ok and it should work. I tried this , but its still not working. I am using Vista with with .net framework 3.5 and itunes version 9.0.0.7…. i dint get it right with the latest version of itunes either. 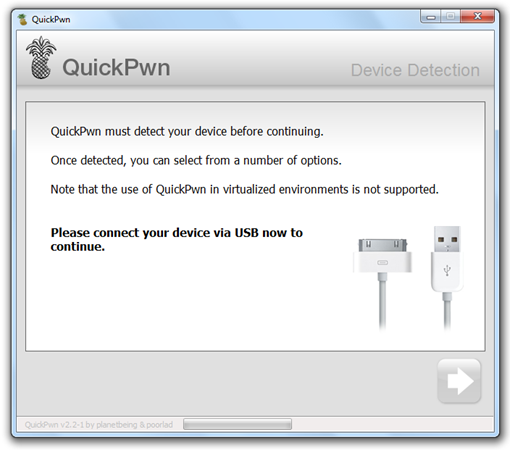 i need help with quickpwn please, is there anything else i can use instead of quickpwn…. i tried updating my firmware and dowgrading my itunes for it but it doesnt work . to get QuickPWn running again. Uninstall latest itunes and install an older version i.e. 7.5/8 etc. Next, right click on the QuickPWn.exe and Extract to QuickPWN. Go into that folder and select all and copy. Then navigate to C:program filescommon filesappleapplication support and paste the contents of the QuickPWN folder. Lastly navigate to C:program filescommon filesapplemobile device support and create a folder and name it 'bin'. Copy the 2 files C:program filescommon filesapplemobile device support called iTunesMobileDevice.dll & MobileDevice.dll to the new folder named 'bin' Now run QuickPWn from where you pasted it earlier (C:program filescommon filesappleapplication supportQuickPWN.exe). That should do it. would this work on iphone 3G with ios4.0.1 and baseband 3.13.04? I am having a problem, on the the part about Selecting the firmware 3.0.1 .ipsw file you downloaded in Step 2, iTunes only option is to download iPhone firmware 4 I am not allowed to choose, even if I put the 3.0.1 ipsw firmware on the correct localization (MAC: “~/Library/iTunes/iPhone Software Updates” ). Anyone can shed some light? I would appreciate.